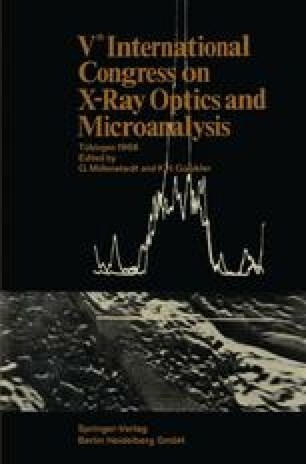 In mathematical procedures for relating the X-ray intensity measured with an electronprobe to concentration values the fluorescence due to the continuous spectrum (“ continuous” fluorescence) is generally neglected. Only the fluorescence by characteristic lines is taken into account in addition to absorption, and atomic number effects. This seems to be justified since several authors in particular Kirianenco et al. (1962) have demonstrated that the influence of the continuous radiation is fairly small. This is so even in cases where it might be expected to be considerable, namely where there is a big difference in the average atomic number between specimen and standard. But there are definitely instances where this effect is appreciable and should not be ignored. The present study sets out to evaluate the continuous fluorescence correction for a large number of specimens in order to establish to what extent the omission of this correction affects the accuracy of the microprobe determinations.